Faucets need a little updating? We do that too... Serving Prescott Arizona businesses, getting the job done right! Why Choose Bar None Plumbing? With over 25 years of experience, the owners and staff of Bar None Plumbing are excited to bring the highest quality, affordable service to your Prescott home. From basic plumbing troubles to water heater and flood prevention services, Bar None Plumbing will be your #1 choice among competitors. Fully insured, Bar None Plumbing has the craftsmanship and award-winning customer service you’re looking for. You can rest assured that you will be receiving service of the highest level of excellence. Our company is all about the customer, meaning that we treat your home like our own, we treat our clients like a long time friends, and we will do everything in our power to guarantee you will be more than satisfied with your service. Being locally owned and operated, we pride ourselves in our community excellence and reputation. Also stop by our testimonials page to see what other customers think about our service. 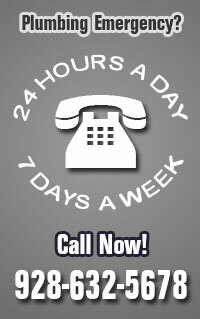 Bar None Plumbing offers 24/7 emergency service so a representative will always be available for regular and emergency service.